Newer: » San Mateo Bombers are 6-a-side Tournament Champs! There's a lot to say about Skydiving. However, experiencing it for myself, I came to notice that the hardest part is actually signing up and the anticipation of the dive. By far the most extraordinary, fantabulous, extreme, amazing thing I have ever done in my life - and I have done a lot. Before skydiving, I thought that bungee jumping was the most extreme thing there is. However, that has changed. As you sit awaiting your turn, anxiety sits in as you see the professional jumpers getting strapped and preparing. The moment your name is called, you know, there's no turning back. Nick Boyd, with over 7000 jumps under his belt, was my tandem master. After a short introduction, he instructs me as to what will transpire as we board the plane and make our ascent. At the ten minute-to-board call, he comes over and assists me into my gear, securing each strap. Kinda loose, I thought. However he quickly assured me that upon jumping, there will be no slack in any of the straps. As we make our way down the street to the Shark Plane, passersby cheer us on and comment, "You're gonna jump", as the nervousness quickly subsides. Chatting with my buddy, I am totally confident that I want to do this. Inside the airplane, Nick and I, being the first ones to board, go all the way to the front. With me seated with my back to his stomach, he explains the exit strategy. With a "thumbs up" and "I got this", I assure him that I am ready for the jump. As the plane climbs to 5,000 feet, San Pedro looks pretty good. At 13,000 feet, the door opens and divers begin to make their way out the door. I look over, and there's Ms. Rosalie Staines, pumped up about the jump. Her and myself being the only two tandem jumpers, I was in good company. We slide to the end of the long char, as Rosalie and Kai take to the air, it's our turn. In no time, my legs are hanging outside the plane, looking below me, San Pedro looks pretty small. It was time to let go. As previously informed, Nick pushes forward, then backwards, and then - we're out the plane. My heartbeat races, as I come to grips with the fact that I was at 13,000 feet and free falling - my life completely in the hands of tandem buddy Nick. With perfectly arched back and shoulders bent, clear skies, no clouds, the view is something that honestly, words alone could not explain. The wind pushing force against your body, completely weightless, and for me - absolutely no cares in the world. But enjoying the fall and being totally confident that Nick was taking care of everything else. With Whitney falling with us, same speed, now that was pretty awesome, as she took videos and documents of my fall. After about a minute or two of free falling, Nick pulls the strap and our canopy goes up. At this point, goggles come off and we simply glide for the about seven minutes. As we chat about his dives, and point out some of the really awesome resorts and even my house, the remainder of the fall was quite effortless and provided a view of the island, like I had never had. The moments when we were not talking, there was an air of peace, quite, serenity - while it did not last that long - being able to capture that moment and extend it - was priceless. Zig zagging in the air as we near the ground and our landing strip in front of the Reef Village, Nick explains the landing. Legs in the air for couple seconds, and hey, whadda ya know, we're on land. What better way to skydive, when all you have to do is enjoy the sights and the experience. With a fresh rush of adrenaline, in about six to seven minutes the experience was over. Oh, but what an experience. For individuals craving to do something extreme, different and what could easily be a lifetime experience - skydiving should definitely be on the top of your list. As for me - I would do it again in a heartbeat. 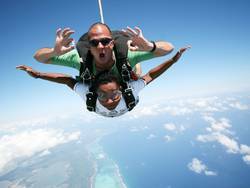 To book your tandem jump you can call Sunbreeze at 226-2191 or stop by the office and book your jump today! The cost of the tandem jumps is $225US or if you prefer to take stills and camera footage along with the jump its $110US additionally for the DVD.